We want to make your stay even more memorable. 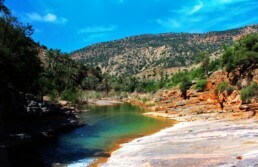 We can arrange a number of activities for you to experience the amazing scenery and culture that Morocco has to offer. Its the perfect way to spend a day resting and relaxing, to allow those sore muscles to recover ready for the next day of surfing. Did you know there is a real paradise on earth? Enjoy a day trip to Paradise Valley. It’s a breathtaking oasis of palm trees and natural pools built by a small river. Paradise Valley belongs to the valley of Tamrhakht a part of the westernmost High Atlas. This small paradise will enchant you with its waterfalls and trees full of fresh fruits. In the river and water pools you will find plenty of fish, frogs, and if you are lucky you can swim with a family of Spanish terrapins in the crystal clear water. The area around the Paradise Valley is specialized in the production of honey and you will find the expensive but famous Argan oil. We can organise half or full day visits to Paradise Valley, just contact us via email or ask us when you arrive for further details. If your arms are hurting and your body feels tired after all the surf, you can opt to visit a traditional Hammam. In a Moroccan Hammam you will usually find a series of rooms from hot to cool. 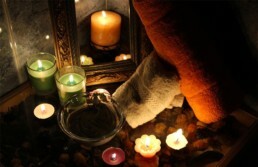 Options are also available to have a massage with a hammam or as a stand-alone treatment. 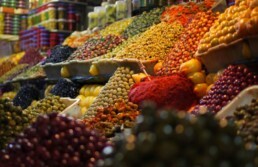 The Souk El Had in Agadir it’s a must-see. If you want to see the hustle and bustle of a traditional market or you would like to buy some souvenirs for your family and friends at home, the souk is the right place for you. Enclosed in traditional high walls, there are over 3000 stalls selling everything from household goods and fruit, to precious spices and souvenir knick-knacks. A bonus is the opportunity to test out your haggling skills to see what kind of deal you can get. We have several options available to visit the Souk, either as a single activity or this can be combined with a Hammam or a visit to paradise valley.